This copy of the Four Gospels has notes on the final flyleaves relating to S. Augustine's abbey, Canterbury, and the main scribe has been identified as the scribe of a number of other Canterbury books, which makes it almost certain that this manuscript was written there. This initial 'L' contains irregular foliage within very precisely drawn vertical bounding-lines. 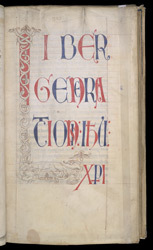 The partial red background gives the appearance that the decoration is unfinished, but in view of the variety found in the other initial sin this manuscript, it is perhaps more likely that this effect was deliberate.